Not every Asian is that rich, and nor are they members of the social elite. In Kevin Kwan‘s novel, Crazy Rich Asians, he is out to satirize that culture. The film of the same name certainly glamorizes what is, and how filthy, stinking rich some can become when they come into positions of power. When they are well connected, these people can advance far, and these nuances show up in the book trilogy. When they do not, just where they sit in this chaste society can either be in the lower echelons or high up. Ultimately, this movie is more of a romantic comedy than a send-up of a who’s who of Singapore. The cultural notes are well placed and they offer nothing new to those who have studied this region. With the soundtrack, I believe it’s a foregone conclusion that in entertainment, the same old set of tunes are used over and over again instead of producers offering new scores to use. I recognized most of the tunes as I regularly heard them in my household back in the day. The fact they are still popular is scary! With no surprise, the matriarchs hold more power than the men they have married. For Nick Young (Henry Golding), son of a well to do family dynasty, he ran away from it all and have a life in America. He’s not a satellite kid (a topic I would love to see explored in a future book or film). Instead, he wants nothing more than to distance himself from it. 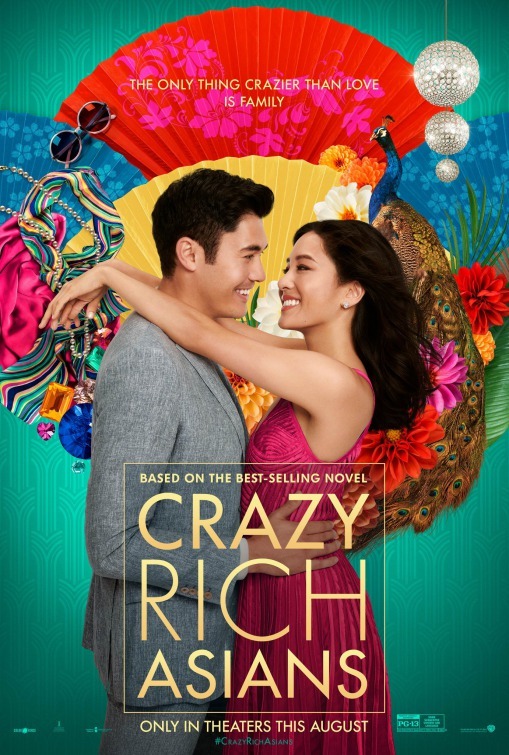 The love of his life, Rachel (Constance Wu) agrees to come home to meet that family, only because he is the best man for his best friend’s wedding. She knows little about his past, and in what she learns as this film unfolds requires shock treatment. The performances are gold. Wu has a simple charm about her which makes her the star of the piece. The moments with Michelle Yeoh as Nick’s mom can easily send shivers. I found moments of this family dynamic completely relatable. Respect for those elders must be paramount. As for all those aunties, uncles and cousins … sometimes you have to roll with and try to understand. This movie is almost like The Fresh Prince of Bel Air. Instead of Will, there’s Rachel, an American born Asian carrying a touch of that New Yorker attitude. She is charming but yet will take no attitude than one raised from the motherland. This film does not go too deep into this divide, but I know in most Mainland and Immigrant Chinese can recognize foreign-born easily. This film is not out to divide but rather hits home with this viewer. This work is more like watching a soap opera, complete with cliched characters to exaggerate a crazy class of citizenry which no one wants to become. Goh Peik Lin (Awkwafina), Wu’s roommate from college, is a shining example of how East wants to be like the West. She’s quite the character, and her family is over the top Vegas showroom wannabes not only with a father who thinks he is Elvis, but also a creepy son in the thralls of experiencing puberty. The rest of Lin’s siblings are not as bad but it did me leave me wondering if the book offered more substance to this oddball family whom Wu has to deal with. Part of this film’s casting choice strikes me as unusual. The film introduces Nick as a boy who went to live in London and no further connection was made other than to imply he’s stayed in London long enough to gain an accent. Although Golding is new to cinema, with only a handful of films to his credit, his good looks will get him far. He is certainly leading man material. The Young family’s drama is just starting and I am betting the next two books will be adapted to film. A quick look at the synopsis for the books China Rich Girlfriend and Rich People Problems certainly puts ABC’s Dynasty to shame. Love on the line instead of settling family disputes. In the case of whether Nick will inherit his family’s fortune, the wait is on for the next parts of the trilogy to be made, or I just read the book. ← The Art of How to Train Your Dragon: The Hidden World, Advance orders available!